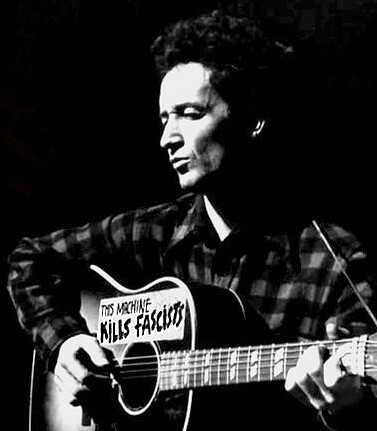 Im imagining a church in a small town, a mostly-white town like the one where I grew up, where a hymn becomes a dialogue and a Woody Guthrie song becomes a one-man play. The choir rises, the organ plays an introduction, and two soloists step forward. Well call them Gold and Blue. Gold begins with a smile. Blue interrupts with a frown. The choir echoes that assurance. Meanwhile, Blue has been frowning about something else. Gold interrupts, happily anticipating whats coming. Oh, the bliss of this glorious thought! Gold cant help adding something. Not in part, but the whole! Blue is finally able to finish testifying. And I bear it no more! And the choir joins in the refrain. Two dozen children stand up and sing enthusiastically. They repeat the chorus, encouraging the congregation to join them in clapping. Then they return to their seats. Wonderful! Thank you, children. We must always remain proud of this beautiful country that God has given us. Our promised land, if you will. Our exceptional nation. Theres a noise at the rear of the sanctuary. A door opens, and a man enters. The congregation turns to gape. He points at the congregation. That side, he says, was made for you. He stares at the faces, left to right, for an uncomfortably long time. Finally he steps back and begins shuffling away. The stranger begins to tell how God spoke to him. He turns again to the congregation and clasps his chest. This land is my land, he repeats.